International auto shipping can be a major concern for people looking to ship their vehicles overseas for a variety of reasons. Everything from the money for payment, to preparing the vehicle for shipment, can leave you with questions. To help clear the air, this post discusses some FAQs by individuals looking to ship their vehicles internationally. Take a look. #1. What documents are required for international shipping? You need several documents, such as the original Certificate of Title of Ownership, Certificate of Origin (if the car is firsthand), Bill of Sale, and Power of Attorney (in select ports) that authorizes the clearing agent to complete the documentation on your behalf. After the vehicle is shipped successfully, make sure to get back all the documents you submitted to get the required clearances. #2. Who can pick up the vehicle at the port? Most international auto shipping services providers only allow you or a person you authorize to pick up the vehicle. Should you wish to have someone else pick up your car, inform the provider well in advance so they can adjust their records and ensure hassle-free shipping. Any failure to do so can result in additional fees. The consignee may be required to prove their identity, so ensure that they have a photo ID when picking up the vehicle. #3. Is it important to get auto transport insurance? It is a national requirement for providers to carry at least $75,000 of liability insurance on all shipments. Many providers increase the coverage to ensure safe transportation to clients. The coverage primarily depends on different factors such as the duration of the trip, or the model and year of the vehicle. When researching international shippers ask what type of shipping insurance they provide, and what they cover. #4. What factors should I consider when choosing an auto shipping company? At EasyHaul, we provide national and international auto shipping services to meet varied transportation needs. Our service features include providing timely updates and paying different clearance taxes on your behalf. We only work with bonded and insured carriers to ensure timely and hassle-free delivery. #5. What gas levels should be left in the tank? This question may vary case-to-case, but often times international shippers may ask that you drain your vehicle’s fuel tank so that it is only a quarter-full. 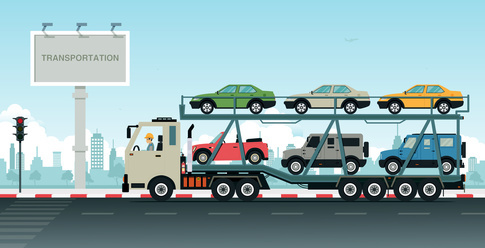 International auto shipping service providers may drain the fuel tank (if the fuel level is more than the permissible limit) before storing the vehicle for shipping and can demand extra fees in lieu of the additional service. #6. What does a customs clearance broker do? Shipping laws vary according to location. Transporting your vehicle to an overseas destination can be confusing if you do not know the local laws. To help you in such cases, custom clearance brokers complete all documentation, including import formalities on your behalf. In many instances, shipping providers offer contact details of the relevant customs clearance agents to help customers avoid hassles. #7. What do destination charges entail? Destination charges can include offloading charges and documentation fees. The fees differ according to the destination country. To avoid confusion, make sure to research potential charges in advance. #8. Who pays for custom clearance? At EasyHaul, our goal is to help customers avoid hassles during international shipping. EasyHaul will take care of U.S. customs for you. In rare circumstances, U.S. customs may return the shipment for re-inspection, any additional charges that result will be the responsibility of the customer. International vehicle shipping can be a complex task. You need to abide by various regulations, prepare your vehicle accordingly, and complete all the necessary documentation to ensure hassle-free shipping. At EasyHaul, we provide comprehensive support before, during, and after your vehicle shipping to help avoid all inconveniences. To learn more about our international vehicle shipping services, fill out our contact form or call at +1 (360) 597-9320.